The special edition of the renowned C50 carbon clincher wheels, that we like to call C50 BBR, is the only wheelset you need. It is a mid-height and –weight, high-performance wheelset that great looks both during the day and at night due to unique decals. When you ride in a wide variety places, you need a wheel that will be able to excel in all conditions and the C50 BBR can do that. It has a 50 mm aerodynamic profile that gives you extra speed on flat roads but the shape means it’s easily controllable even when it gets a windy. The rims measure 24 mm wide and this allows you to run wide tyres so you’ve got lower rolling resistance, a more comfortable ride and lots of grip; you’ll appreciate the extra grip when the weather gets bad or you’re descending or cornering. To put your mind even more at ease on descents, we use our extremely high TG resin when making these wheels. This allows us to make wheels that can handle very high temperatures you find on long descents, without suffering damage. You can ride the Alps and enjoy the speed on the way down without worrying about overheating your rims. There are few things more annoying than a set of wheels that flex when you want all your energy to get up the hill or extra speed in a sprint. We use our Dynamic Spoke Pattern that transfers more of your power through the wheels, to the road so you’ll be faster on the climb or to the line. We lace these spokes to the lightweight Arsenal hub which uses our Weapons Grade Machining process to eliminate extra grams and provide a precise housing for the smooth rolling Premium bearings. They may be small details but we take pride in them because sensitive riders, like us, notice the difference. 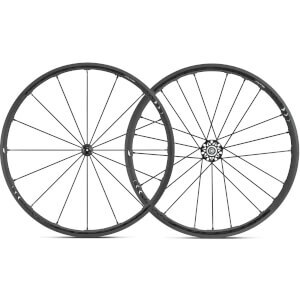 The thing that sets this wheel apart most from the standard C50 is the decal. We use black reflex so the wheel has a fast, subtle look during the day and perfectly matches any bike on the market. In low light conditions, when the wheels are hit with a bright light, they light up and become bright white. Your bike will look awesome in photos and drivers will be able to see you more easily making this wheel great for riding early in the morning or in the evening. It goes without saying that they look great in the day. If you’re looking for one wheel for all your riding and racing needs, this is it. It’s got all the go fast features you want, combined with the convenience of clincher rims. To match all this performance, we use unique decals that set this wheelset .